Committee members M. McRae and R. Jochym set out on the first outing of the MBC for the 2017 season from Concordia University. 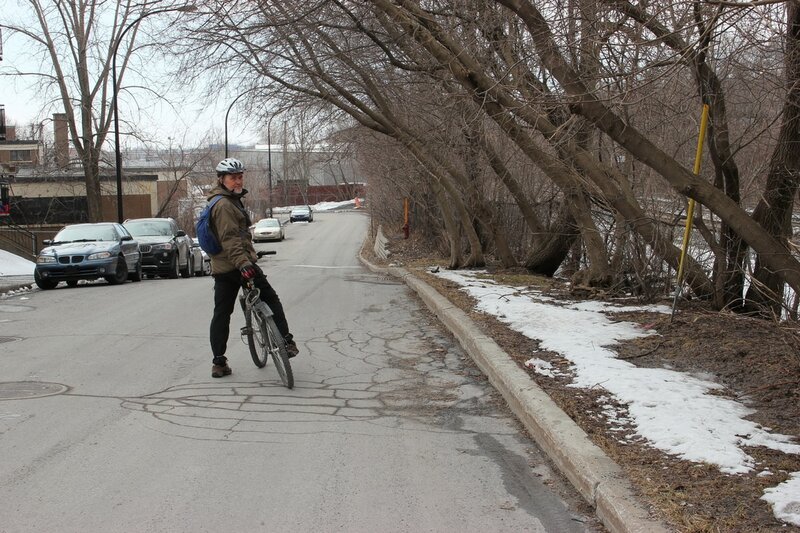 Along the way they reviewed cycling path infrastructure along the de Maisonneuve path. Special attention was given to signage and intersection crossings. Their observations will be made part of a report to be submitted to appropriate bodies. Interestingly geo-tags will be placed in the future that will reference different parts of that report. 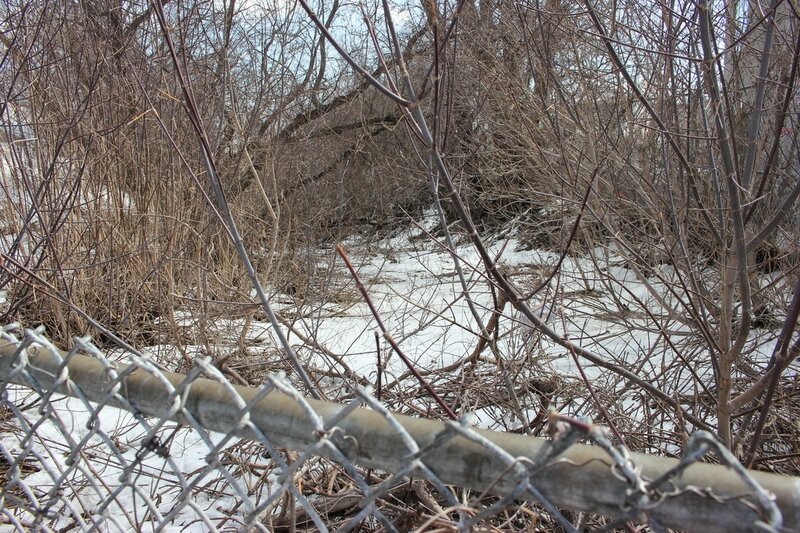 As part of the ride they located the northern jumping-off point of the proposed Dalle Parc near St Jacques and Cavendish. The Montreal Bicycle Club was founded in order to promote cycling. On the first Fixture ride of the re-founded club the members discussed three issues regarding cycling in Montreal and took applicable pictures. Although the ride was planned to go to Lachine because of the depth of the discussion we went only as far as Grand Blvd, having lunch along the way. In a world class bicycle city,which Montreal aspires to be, all principal roads would be cycle friendly. How this could be accomplished on Sherbrooke street was discussed and compared to what Toronto has done with Bloor street. 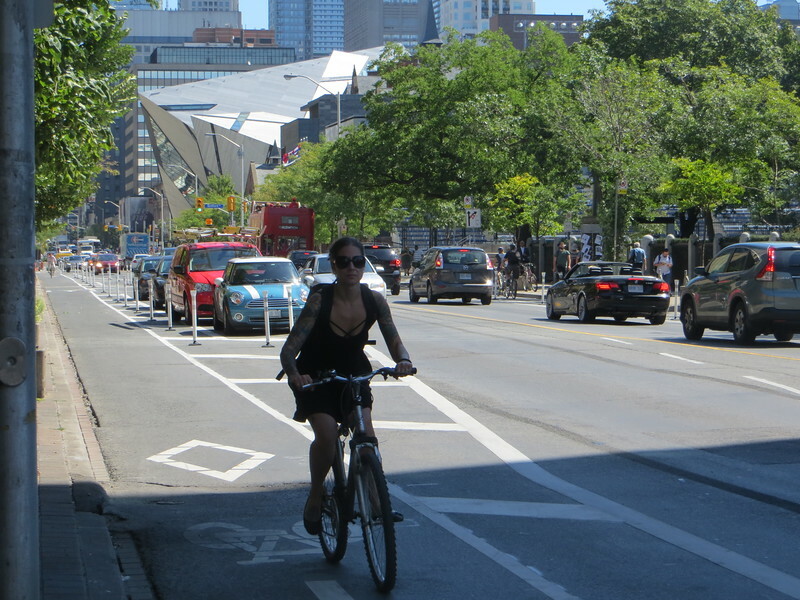 Last fall Toronto built a modern bicycle path (one that is separated from traffic, and each side of the street has a unidirectional bicycle lane) . Since Bloor and Sherbrooke are the prinicipal east - west urban streets of Toronto and Montreal, it is valid to compare the two. The Toronto path extends westward along Bloor street starting at the Royal Ontario Museum. The picture on the left shows cycling with the ROM in the background. 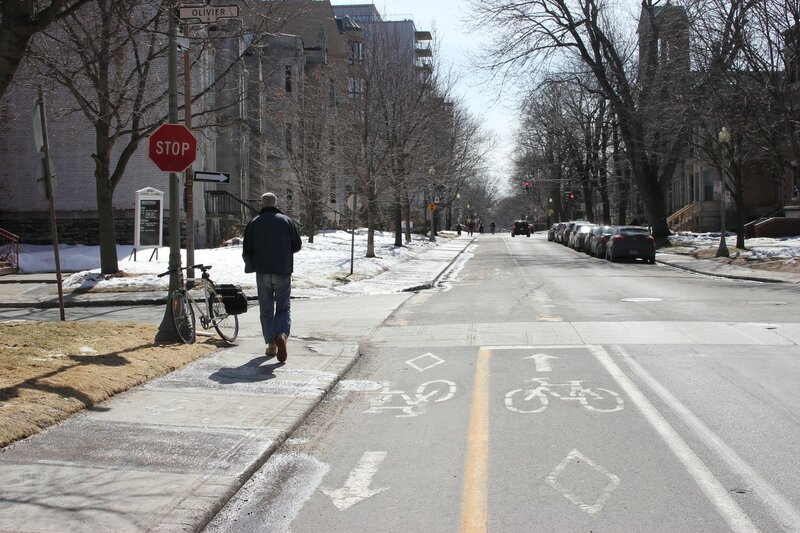 The picture on the right shows cycling on Sherbrooke street near the Montreal Museum of Fine Arts. Montreal has a much larger protected bike lane system than does Toronto, but it seems it will soon have competition for bragging rights. Within the de Maisonneuve bicycle path from Guy to Girouard, there are three different municipal bodies that manage various portions of the same path. Ville Marie manages from Guy to Atwater, Westmount from Atwater to Claremont, and NDG the final section to Girouard. In the downtown Ville Marie, the street is one way (westwards) for cars and on the south side there is a bi directional bike path. The path is separated from cars by a concrete barrier. In the Westmount, the street is narrower but has a similar arrangement to Ville Marie. However instead of a concrete barrier the path is separated from cars by bollards in summer, and has no separation in winter. A portion of the Westmount path also travels through a public park, it follows the trajectory of de Maisonneuve, a portion of which was removed in the 1970s to connect together two parts of Westmount park. 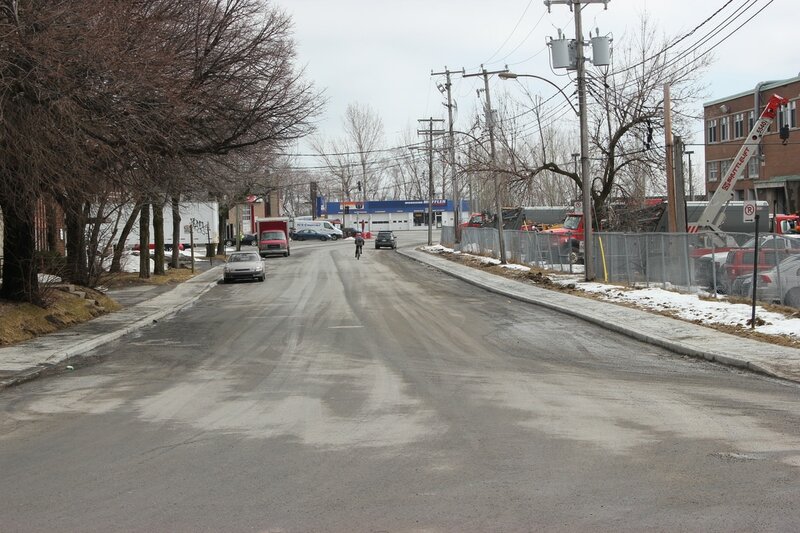 In NDG , from Claremont to Decarie, the street is bidirectional for cars and the bicycle path is on the north side. A busy Metro, bus. train station is located on the south side. The bicycle path is separated from cars by bollards winter and summer. At Decarie blvd there are two connecting uni-directional bicycle paths to and from the MUHC on the south side of de Maisonneuve . West of Decarie at Prud'Homme the path again switches to the south side with bollard separation. Each of the three portions handle the intersection design differently, with different policies for stop sign placement, driver awareness signs and traffic light systems. In Ville Marie, intersections such as Pierce, that have no traffic lights and north bound car traffic, stop signs are placed for north bound cars before the intersection. In Westmount on all bike path intersections without traffic lights, stop signs are placed in every direction as a traffic calming measure. In NDG, west of Claremont, until Girouard, stop signs are again placed such that they affect only the cars that cross the bicycle path. This design practice leads an abundance of stop signs along the Westmount portion of the de Maisonneuve bicycle path. Westmount also has a very low compliance by cyclists for stop signs along it's portion of the path. The city's approach to this problem has been to crack down and issue many tickets to cyclists for stop sign violations. Car speed bumps in lieu of east - west stop signs along de Maisonneuve, or additional pedestrian cross walks, might be the traffic calming measures that give better results along a street that has a highly used bicycle path. 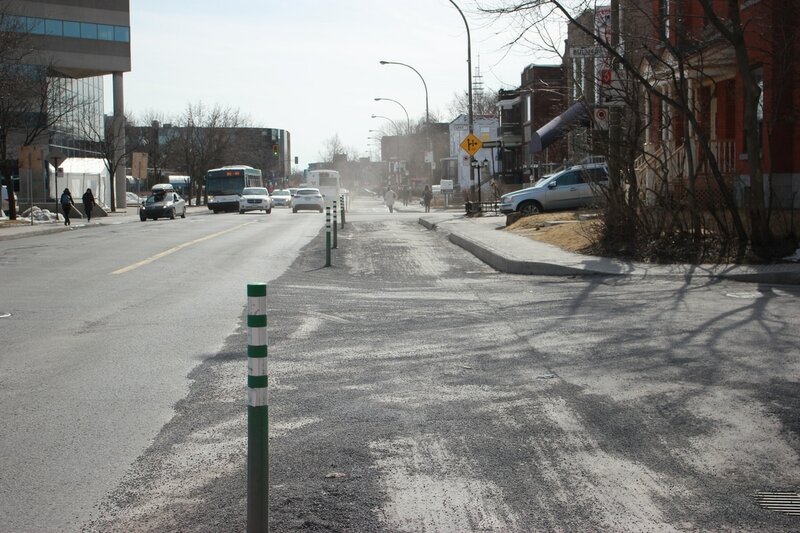 The NDG section from Claremont to Decarie is the only portion of the de Masionneuve bicycle path which is bi directional for both cars and cyclists. On intersections with no traffic lights such as Grey and Bulmer this gives an added danger to cyclists who may be hit by cars hurrying to cross a traffic lane in addition to crossing a bidirectional bicycle path. This section of the path is often referred to by cyclists as "The Danger Zone". 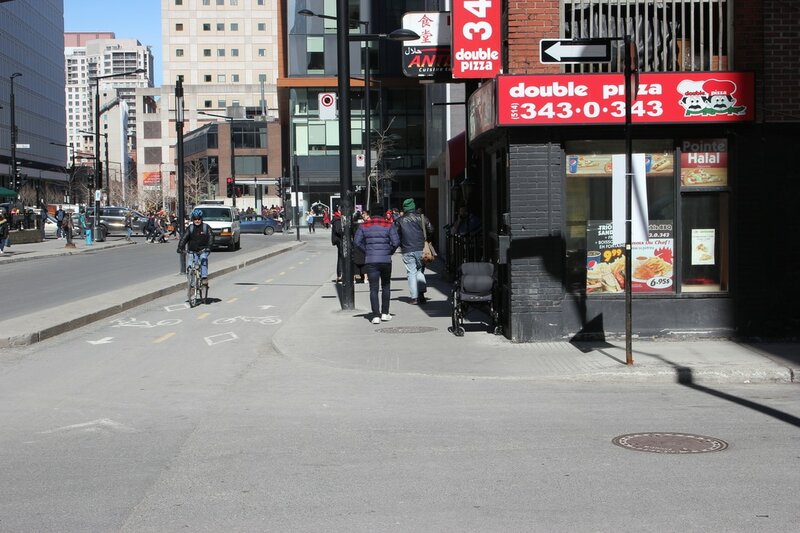 The de Maisonneuve bicycle path is separated from cars by bollards or concrete, so the primary safety concern to cyclists is being hit by a car within an intersection. The much larger mass of the car makes it likely to be a more serious accident than hitting another cyclist or a pedestrian. Collisions between cyclists and cars along this portion of the bike path typically happen by a left turning car entering the bicycle path for one of these three reasons..
1.There is confusion between driver and cyclist over who has right of way. 2. The driver is unaware he has entered a bicycle path. 3. The driver did not see the cyclist. We did not discuss this cause on the Fixture ride. One reason there can be confusion between the cyclist and driver over who has right of way is result of each municipality using a different traffic light system along its portion of the de Maisonneuve bicycle path. A second reason is that signs stating cyclists do have right of way are often not posted. Ville Marie uses an advance straight ahead green arrow, followed by a solid green circle throughout its portion of the de Maisonneuve bicycle path. When the light is green a walk signal is also given. Left turning cars have to wait until the straight ahead green arrow is finished, then are permitted to turn if there are no cyclists or pedestrians. Confusion sometimes develops because drivers may assume that when the light changes from straight ahead arrow to solid green circle they now have right of way over cyclists. Since the walk and green signal are the same it does not matter which signal the cyclist paid attention to. 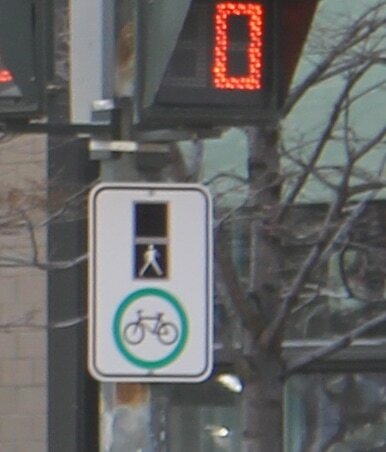 Ville Marie has installed signs that indicate that cyclists have priority over left turning cars at some intersections. Westmount and NDG have not installed any. Westmount uses three different traffic light systems within it's portion of the de Maisonneuve path. The first three western intersections (Wood, Greene and Clarke) use a solid red circle - walk signal for the pedestrian only phase, in which bicycles are not permitted to pass. This is followed by a solid green circle - do not walk phase in which bicycles and left turning cars are both allowed to enter the bicycle path zone of the intersection. Since it is not directly indicated, confusion develops over which of the two signal types the cyclist is supposed to use, as well as confusion by drivers who after waiting for the walk signal to finish now assume they have right of way to turn left on a solid green circle. In terms of the most serious accident type, being hit by a left turning car, the safest phase for the cyclist to use is the walk signal once the intersection is free of pedestrians. 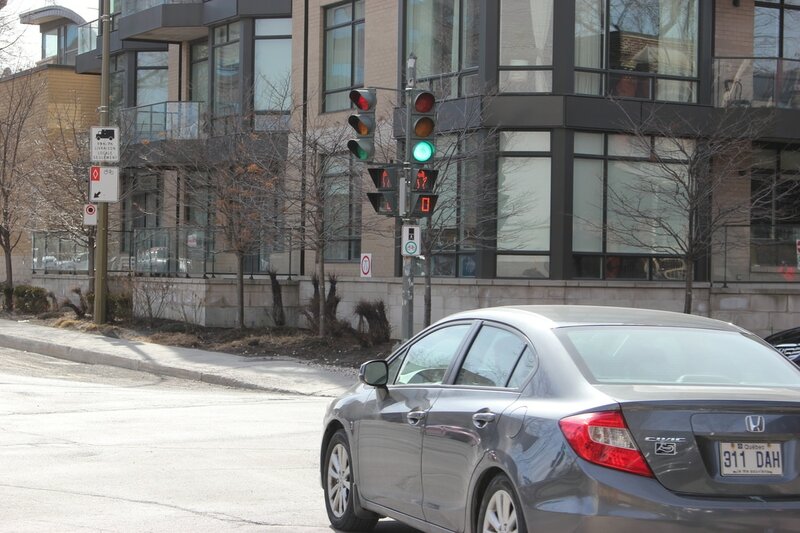 Westmount then uses a traditional red - green traffic signals with no walk indications for the next few traffic light intersections. No special time such as a straight ahead green arrow or pedestrian only phase is given to the bicycle path from left turning cars. Westbound Claremont traffic light seen from south side bicycle path looking toward north side bicycle path. 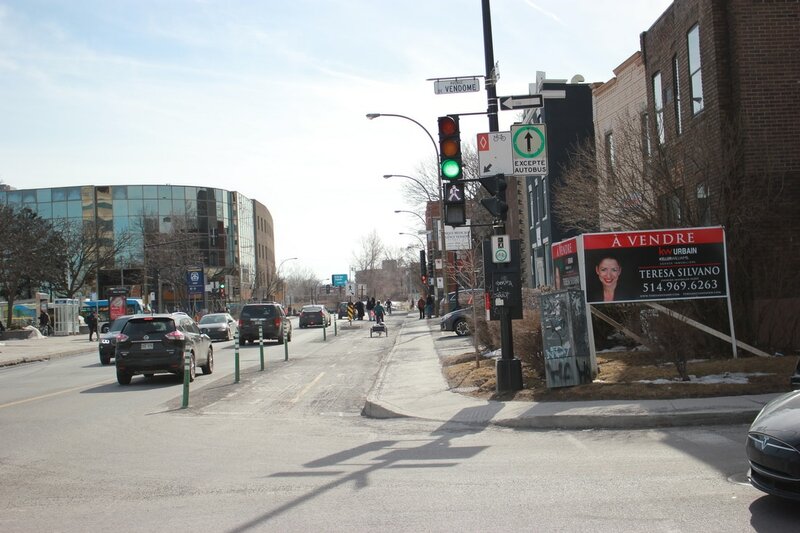 In NDG, north of the Vendome metro station the traffic lights system is the same as Ville Marie, however some intersections continue to post the special sign telling the cyclist NOT to use the green signal but instead to use the walk signal. These signs are meaningless as the walk and green signals are the same. At Decarie, since there is no left turn permitted for westbound cars, the signal following the straight ahead green arrow adds a right turn green arrow. This adds confusion as to the priority of right turning cars and cyclists in the bicycle path now located to their right. It is a complex intersection, multiple roads converging at the same point, an east west bi-directional bicycle path and two north- south uni directional paths on the southern side. It also has meaningless walk NOT green signs for some of the crossings.
. Each of the 3 municipalities looked at have very inconsistent methods of marking the bicycle path within intersections. Much more could be done to reduce this second cause of accidents, drivers being unaware that they are entering a bicycle zone. 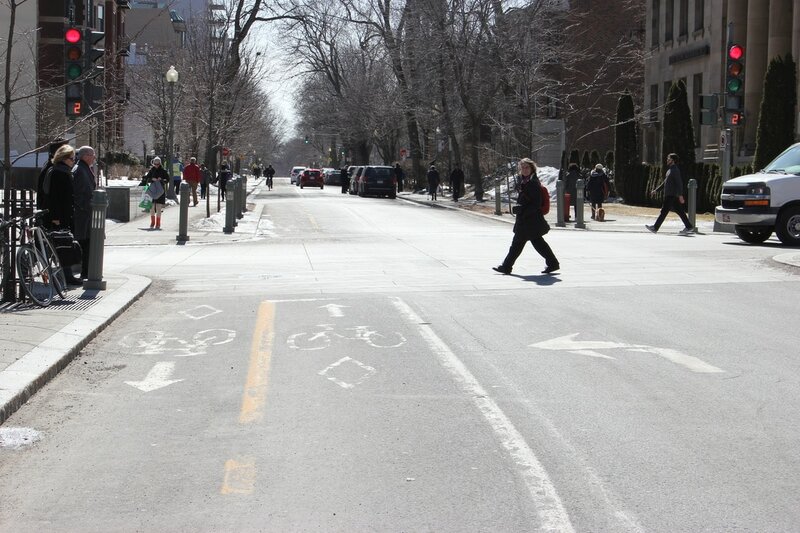 Many intersections have no markings, some have bicycles with chevrons, some have white and yellow dashed lines. 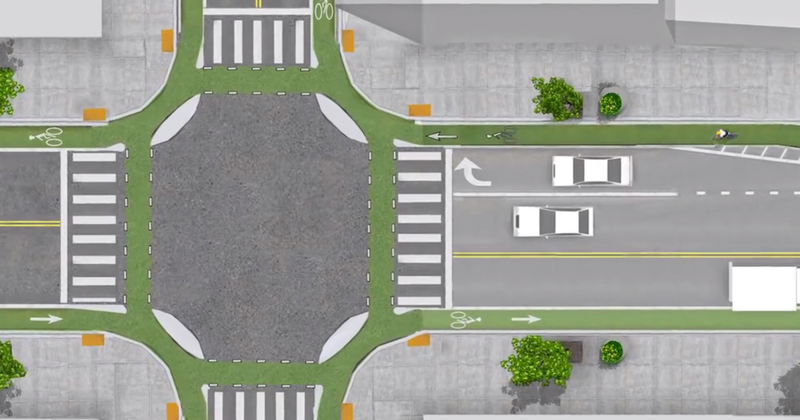 The above picture shows what is possible for a well designed bicycle path intersection. Why not at least have a solid painted bicycle path at all intersections along de Maisonneuve ? Some de Maisonneuve intersections have special problems that make them especially important to warn drivers they are entering a bicycle path. Westmount's Greene Ave is one, since the street narrows within the intersection forcing bicycles into the left turning cars lane. Grey and Bulmer in NDG are other examples since they have drivers distracted by crossing a lane of traffic in addition to crossing the bi-directional bicycle path. None of the intersections mentioned have painted lines to indicate to cars they are crossing a bicycle path. According to the MTQ map of the new Turcot project, there will be a new bicycle path built along the bottom edge of la Falise (the escarpment overlooking the Turcot interchange). Earlier the MTQ had promised a bicycle overpass as part of new Turcot project but it now seems to be in question if it will be built. The overpass would be near Cavendish and connect la Falise path to the Lachine Canal Bicycle path. We were curious how the de Maisionneuve path could connect to this potential overpass which would do much to connect NDG with the Sud Ouest. Generally the escarpment is too steep to bike up or down. However just east of the Rose Bowl it is much less steep and apparently there was a road there at one time. This would be the logical connection route between the new Turcot bicycle overpass and the existing de Maisonneuve bicycle path.